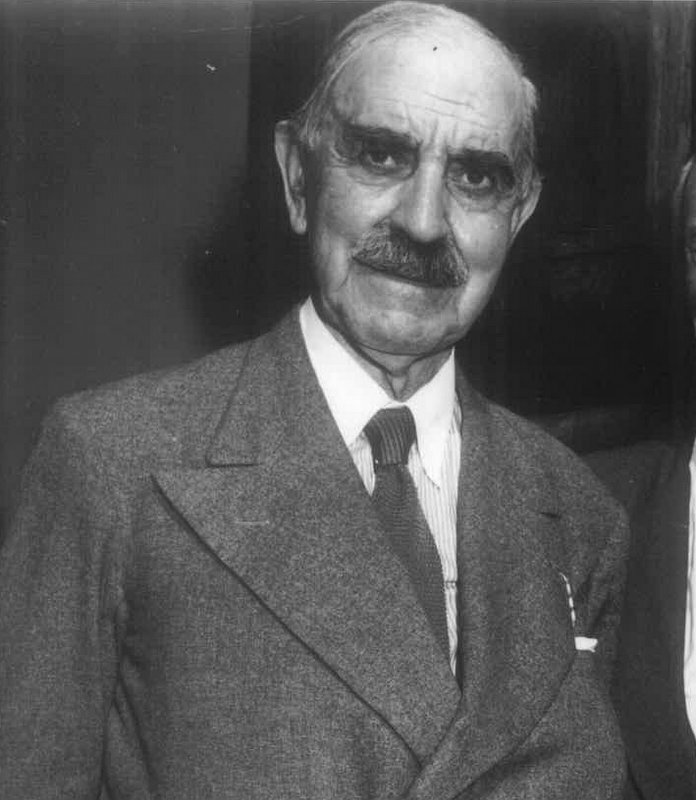 The Railways act of 1921 brought together the independent railway companies of Britain into what became known as the ‘Big Four’ railway companies. The LMS’ head quarters was London Euston, with lines stretching northwards and westwards through the Midlands into Wales, the North West of England, and Scotland and Northern Ireland. The LMS board realised they were losing ground to their LNER rivals on the East Coast Mainline, and internal conflict had prevented progress in locomotive design. A new direction was needed; someone with fresh ideas, and so the LMS sought to recruit William Stanier from the GWR. After running in No. 6201 is painted in LMS Crimson Lake livery, and is fitted with ‘Fowler’ pattern tender. Locomotive is named “Princess Elizabeth” after elder daughter of the Duke and Duchess of York, and is released into service. 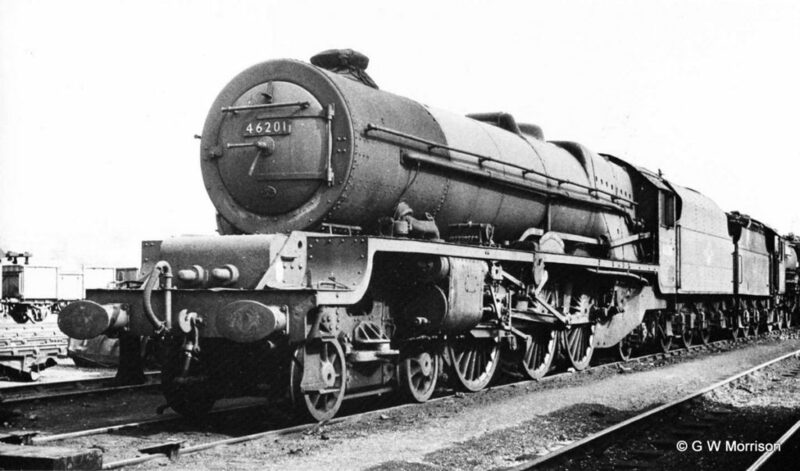 In late March 1935, a new higher capacity tender was fitted to 6201 to replace the original Derby Fowler type design. The new tender helped keep the coal trimmed forward. 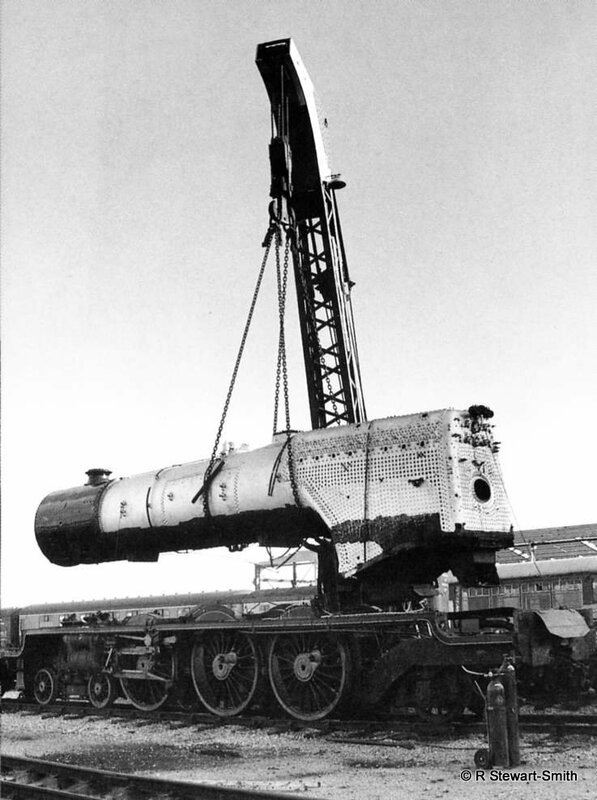 Later in 1935, 6201 received a revised boiler design with a 32 element Superheater, upgrading from the original 16 element Superheater as was originally fitted. It was after these key improvements had been made to the design that the LMS wanted to put the revisions to the test. On the 16th and 17th November 1936; 6201 Princess Elizabeth took the world record for the LMS for the longest and fastest non stop run by steam traction. The average speed on the 2nd day was 70.1mph, a record which has never been bettered! 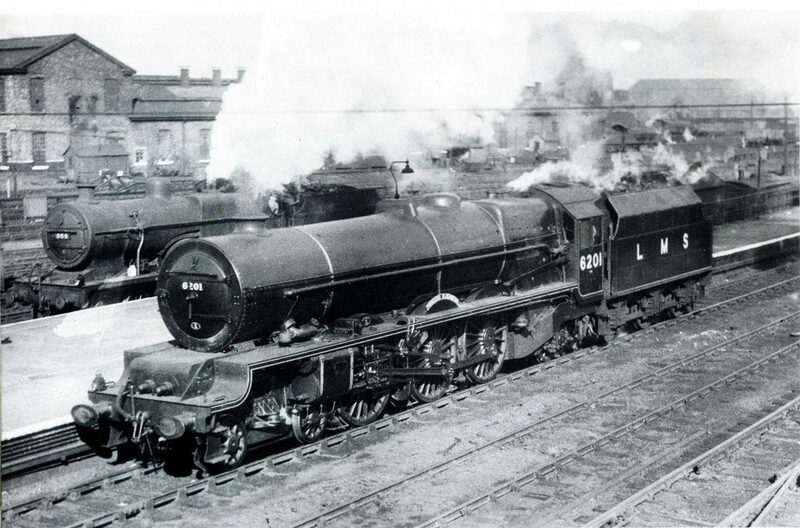 6201 is one of 6 LMS Princess Royal Pacifics to be painted in postwar LMS Black livery. 6201 carries BR Lined Black livery lined in the style of the London North Western Railway (LNWR). Following the amalgamation of the LMS, LNER, GWR and Southern Railways into British Railways (BR) in 1948, LMS locomotives gain a ‘4’ prefix. Almost on her 29th birthday of being built by the LMS at Crewe works, (4)6201 Princess Elizabeth is withdrawn from service by BR, and faces an uncertain future as diesel locomotives take on more and more work reducing the need for steam locomotives. A pioneer in locomotive preservation, (4)6201 Princess Elizabeth is saved from scrap, and purchased by Roger Bell. 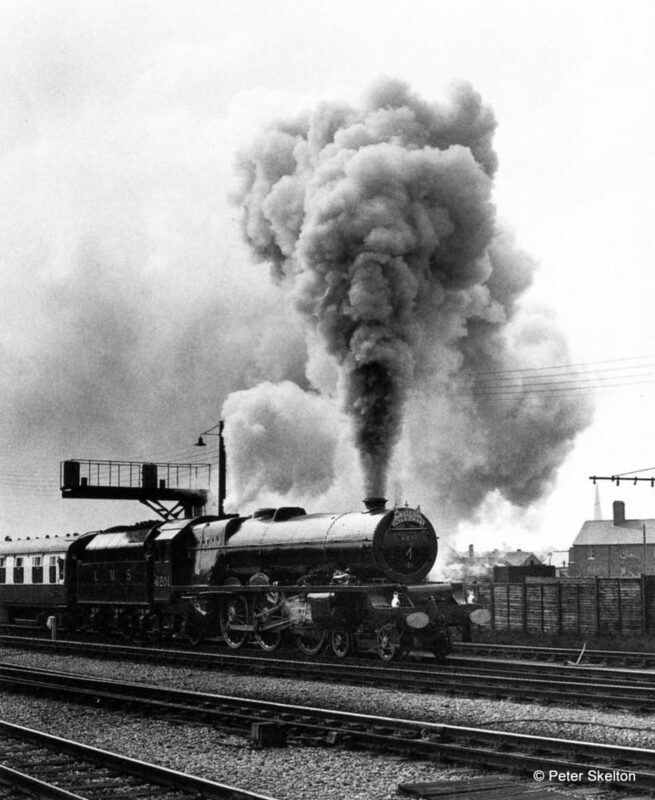 Ashchurch in Herefordshire becomes her home, and the locomotive arrives from Carlisle via the Settle and Carlisle line on its way to Birmingham. Following the vote by society members of what condition ‘Princess Elizabeth’ should be kept in, the locomotive returns to LMS Crimson Lake livery, as seen at the time of the 1936 record run, and resumes its LMS identity as ‘6201’. 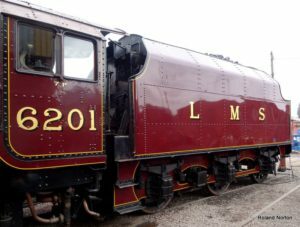 The Locomotive 6201 Princess Elizabeth Society, becomes a limited company. Deputising for GWR ‘King George V’: Hereford – Shrewsbury – Newport – Hereford. On the very next rail tour 5th June 1976 – The “Sir William Stanier Centenary Special”, Mr R A Riddles was guest of honor and rode on the footplate wearing a white coat as on the record run of 1936. 6201 was based at Hereford from 1976 until 1993. 1987 Marked the 150th Anniversary of the opening of the Grand Junction Railway, and Crewe Heritage played host to the Queen and Duke of Edinburgh. During the visit Her Majesty was introduced to the locomotive by Ken Andrews – 6201’s chairman, The locomotive was named after Her Majesty when she was just 7 years old, and to commemorate the event was presented by a Hornby model by society secretary Clive Mojonnier. Bulmers Railway Centre at Hereford was to close, and a new home is found at the Midland Railway Centre, Butterley in Derbyshire. Volunteers have already been working on the tender, but due to the amount of work required the locomotive chassis and tender departs for Tyseley Locomotive Works in Birmingham, and the Boiler to E.Riley & Son (E) Bury Loco Works in Lancashire. 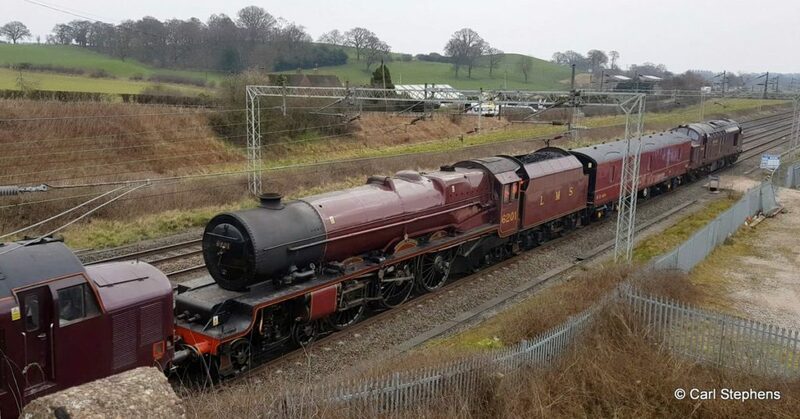 After 7 years, and at a cost over £400,000 funded by the Society through donations; 6201 Princess Elizabeth is finally back in one piece at Bury in Lancashire; which now becomes the new home of the locomotive too. The first mainline test is completed on 29th April 2002, and on the 11th May returns to hauling mainline tours. In advance of the overhaul due at the end of 2012, Tyseley Locomotive Works in Birmingham becomes 6201’s new home, and works a number of Vintage Trains excursions. 6201 Also enjoys long awaited undercover protection from the elements whilst at Tyseley. 6201 Princess Elizabeth takes the starring role by sounding her whistle on Battersea Railway Bridge to signal the start of the Thames Diamond Jubilee Pageant, part of the Queen’s Diamond Jubilee celebrations in 2012. A very memorable day in 6201’s history; for the very first time, the Queen travels behind the locomotive that was named after her, along with the Duke of Edinburgh. 6201 Conveys the Royal couple between Newport and Hereford, and then from Worcester to Oxford. En-route the support crew enjoyed a private meeting with Her Majesty at Kemble Railway Station before continuing to Oxford. 6201 Completes her first rail tour since 2012 by going from London to the West Somerset Railway and back. 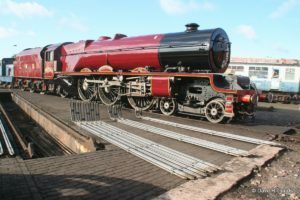 With 5 revenue earning tours left in the 2016, 6201 Princess Elizabeth was withdrawn prematurely from service because of early signs of problems with 5 small boiler tubes. All 123 tubes will be replaced along with many other parts which will all help improve reliability. Could you help bring the Princess back to life by making a donation towards the cost? See below button for more information. With the return to steam a high priority, the society make arrangements for the locomotive to go to Carnforth for further repairs.